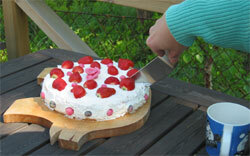 In Sweden it is mothers day today, so of course we celibrated Laila with some cake and flowers. Cecilia and a friend of hers did make the cake all by themself and Alexander and I came with the flowers after our trip to see some gocart racing. Last night it had rain quite much and there had been some thunder and lightning as well and at the morning it was only 12 degrees and some really gray clouds where darkening the sky. During the day it cleared up and the temprature started to rise so in the afternoon we actually could sit in the garden and enjoy the cake. Today Alexander and I joined my friend Peter Junker and went to watch some gocart racing over at Järfälla MotorKlubb, a bit north of Stockholm where Peter also has his own cart located. It was the Stockholm Race Weekend that took place there, and since Alexander has been wanting to get to see Peters cart and see some racing it was a good opertunity. The weather wasn´t that nice to begin with so we actually had some second thoughts about going, but we went anyway. And that was a good thing because it cleared up and was really nice at the end of the day. It was really fun to see some good racing action and nice but fair battles in many of the races as well. When there is about 25 cars out at the same time it is bound to be action and battles all over the track. 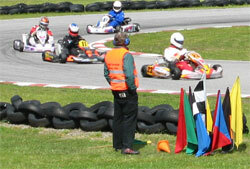 The speeker did review the ongoing action, but who can hear that with a bunch of full throttle carts all over the place? Afterwards we went home to celibrate Laila with some cake and flowers, since it is mothers day today.